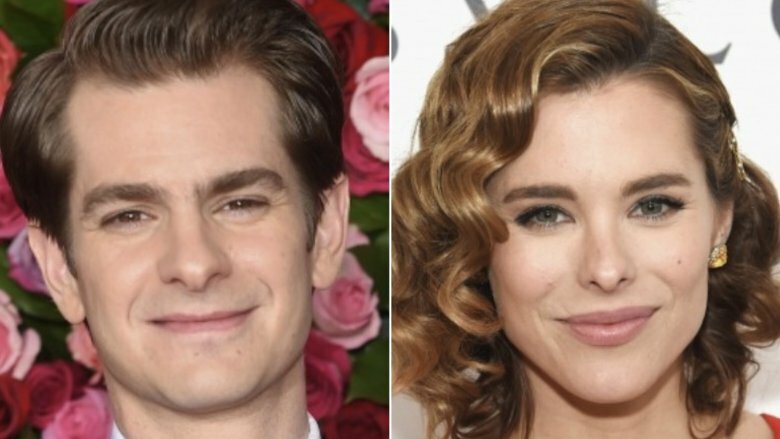 Has The Amazing Spider-Man star Andrew Garfield found love with actress Susie Abromeit? Us Weekly reports that Garfield and Abromeit are definitely dating. Makes sense consider that the two celebs were previously seen kissing and getting awfully handsy while on the beach in Malibu, Calif. in early September (via the Daily Mail). A source told the magazine that Garfield and Abromeit had also had a romantic dinner date days after their beach outing on Sept. 7, eating at the Inn of the Seventh Ray in Malibu. "She had a certain level of glamour," the insider told Us Weekly of Abromeit, who starred as Pam in Jessica Jones. However, the source "didn't see too much" of Garfield and Abromeit's interaction at dinner. The celebrities were later spotted near the Thunder Mountain ride at Disneyland, where they reportedly had "a fun day" with two friends. An eyewitness noted to Us Weekly that Garfield and Abromeit "were laughing about something." At the time of this writing, neither Garfield nor Abromeit have publicly commented on their reported romance. Abromeit was previously a professional tennis player from Boston, Mass., who'd once been ranked number six in the world when she was 16 years old, as reported by The Sun. She later attempted a singing career, releasing the song "Slow Your Roll" with Fat Joe, before ultimately getting into the world of acting. Besides her role as Pam in Jessica Jones, Abromeit has also appeared as Laura in the Tyler Perry soap opera The Haves and the Have Nots, Dahlia Nova in the Lifetime drama Devious Maids, and Zoe Roth in NBC's Chicago Med. Prior to his apparent relationship with Abromeit, Andrew Garfield dated La La Land star Emma Stone from 2012 to 2015. Though neither he nor Stone released a statement following their breakup, Garfield shared that the two have nothing but love for one another despite their separation. "We care about each other so much, and that's a given, that's kind of this unconditional thing," he said on Vanity Fair's Little Gold Men podcast in January 2017. "There's so much love between us and so much respect." Man, why can't all celeb relationships end so amicably?